Sea kayaking among thousand of islands in a unique coastal landscape unlike any you've ever seen! Beginners as experienced, kids and adults up to 130 kg can all find a kayak for their self-guided archipelago tour at a favorable price. We have for rent both single kayaks and big double kayaks. When you hire your kayak you will get fully equipped kayak, safety gear and all our knowledge of kayaking and St. Anna archipelago. Of course you can get fully equipped with all camping gear from us. For rent in May, June and September we give 20%. 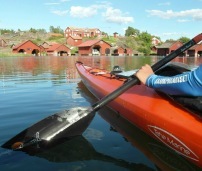 If ou wish to rent kayaks in July and August we give you 10% discount. Kayaking together with us is so much more then just a max safety tour. You will get a more ergonomic kayaking technique, good training in navigation and a lot of knowledge about the St. Anna archipelago. Want to have a maximum relaxing kayak holiday? Bring your own group (min 4 people) and choose an all inclusive guided kayak trip among a maze of islands and skerries. Paddle in peaceful nature, enjoy delicious meals made by the kayak guide and camp in tents on smooth sun-warmed rock slabs on your "own" wild island. You can choose which days you like to visit the the Kayak Paradise. Best option if you want to experience the archipelago by kayak and live extra comfortably is to stay in one of our neighbour's cabins, some with hotel standard. On our site you also find, restaurant, cafe, sauna and relax, small grocery store and a modern campsite. 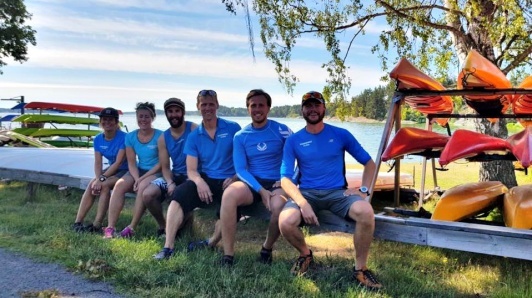 We love outdoor living with sea kayaks and we will do our best to help you to get a amazing kayak adventure here with us. Looking forward to meet you in St. Anna! The Saint Anna archipelago is yours Kayak Paradise! We wish to invite you to our little part of the world that we love so much, St. Anna archipelago, Sweden. Please contact us by mail, form or call us and we will together plan a kayak holiday for you in St. Anna.